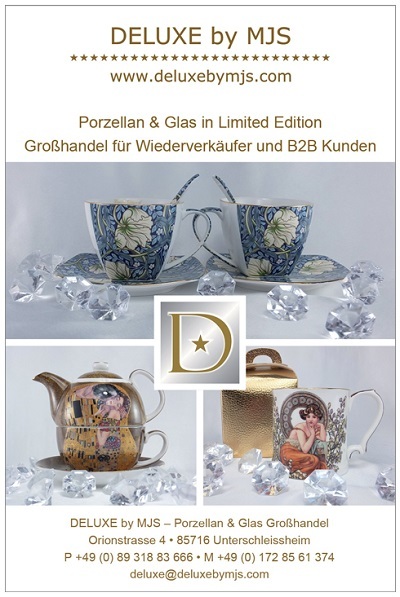 ➤ Elegant Porcelain | DELUXE by MJS | Press reports. In the latest edition of Klassisch Wohnen you will find the ad of our house on page 63. This time the Collection M-Marie - Josée deserved the applause of the editors. Stylish ad and editorial mention. - Gustav Klimt & The Kiss in Black - Coffee Cups Set Triangle. The latest Limited Edition collection - Alfons Mucha - The Four Seasons - espresso cups and coffee cups in Fine Bone China porcelain have even been mentioned twice in the catalog! On page 25 - Coffee cups with teabags and on page 29 - Espresso cups - Set. Gustav Klimt & The kiss in Nero. From this porcelain series Tea for One deserved the special applause of the editorship and was mentioned editorially on page 16. The cappuccino cup with porcelain spoon from the series The Morris fits perfectly in blue.